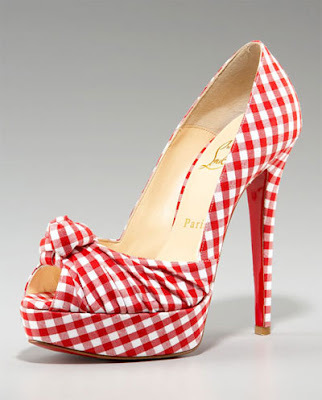 Wow, take a look at this Christian Louboutin pumps and I'm sure you'll love how the gingham pattern was used for this peep toe shoes. This can be an head turner but can break your pocket as well. This Christian Louboutin Gressimo Gingham Knot Pump can be purchased at Neiman Marcus for $875. Does this shoes reminds you of the colorful table cloth during summer? Hmmmm..